This program ended on 05/03/2013 (FRI) 07:35 . This program ended on 05/03/2013 (FRI) 07:35. Congratulations hide on your 20 year solo-career-anniversary! This 24-hour broadcast will consist of clips from live shows, music videos, events, and event some interviews with hide! The winners of the We Love hide 2013 contest will also be announced. They will get some fantastic prizes, so be sure to upload your video quick! We'll be broadcasting hide' ROCK SPIRIT to the whole world! *Note that X JAPAN music videos are not included. Last year we had about 300 entries for our contest! So we'd like to run a similar contest based on hide this year! we're happy to announce that this year will we also be accepting illustrations! 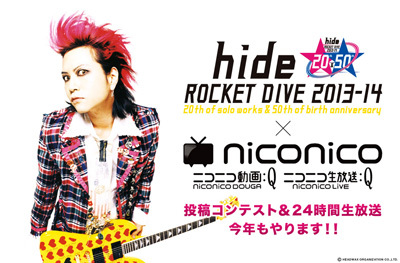 So if you prefer to draw rather than record, be sure to upload your hide entry to Niconico Seiga! This INTERNATIONAL event is accepting entries from ALL Niconico Users! Try taking a video of yourself singing, dancing, playing the air guitar, or gather a band, sing together, or make an air guitaring, singing, rock-out video! Winners will be selected from excellent videos uploaded during the contest period. The winner will receive an excellent prize! Now go forth, make an entry for this contest, and don't forget to tune and enjoy this special 24-hour live broadcast celebrating hide’s 20th year of solo work!